Larry this is such nice information! I have a Lamy Safari and a Lamy joy, and both have been troublesome for me. I’m forever having to shake the ink down, or screw the feed, as they don’t flow nicely. I have cleaned and cleaned them to try to fix the flow problem. Tried different nib sizes from ef to calligraphy, no difference. It really irks me, since so many others use and recommend them without problem. Not so for me! Perhaps I don’t use them daily, and this is why they clog up for me (d’atrementis black is all I use in them). I’m interested in trying these Pilots you refer to. 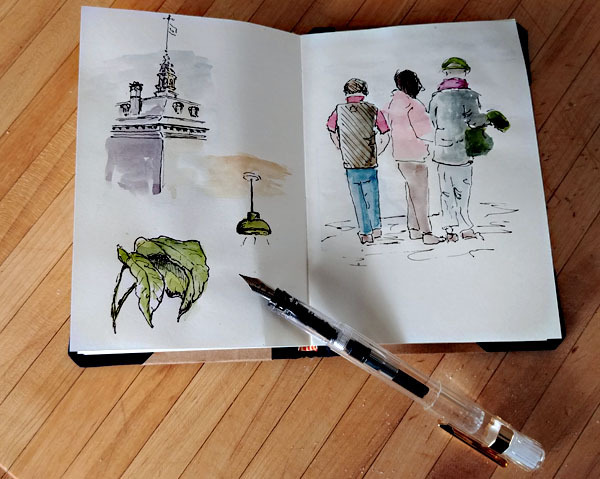 Though I hate to throw more money into pens, as my experience has been far from smooth. I have a Pilot of some sort somewhere in a drawer… can’t remember which one, I’ll have to dig it up and see if I get better results. Thanks for the detailed review! Sorry to hear that you’ve had trouble with your Lamys. I’ve read occasional reports such as yours but have always dismissed them since so many people seem to like their Safaris. I own 3 Lamys and they’ve always worked flawlessly for me but I really don’t like the triangular grip for drawing and so don’t use them much. While using a pen regularly certainly helps, the notion that they have to be used daily is an exaggeration. I just grabbed three pens I’ve had laying around that haven’t been used in weeks. My Platinum Plaisir is full of Platinum Carbon Black and it’s been weeks since I last used it. It wrote immediately. Same report for a Platinum Carbon pen which has been sitting around for even longer. 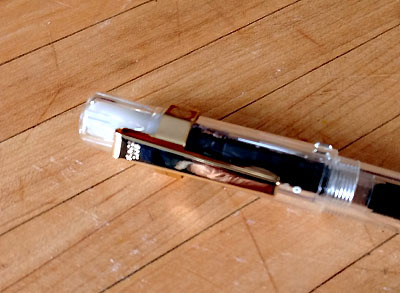 Then I tried a Kaweco Al-Sport that’s been sitting on a shelf waiting for me to clean it…for months. It still writes. It’s so hard to trouble-shoot a pen from a distance but let me ask you a few questions. 1) Do you live in a hot/dry climate? If so, the possibility of ink evaporation, nibs drying out, etc. will be more of a problem for you. I don’t live in a warm place but our humidities tend to be on the mid/ to high side. 2) You mentioned having to shake the ink or screw the feed. Is your problem that the ink ends up at the wrong end of the converter, leaving the back of the feed mechanism dry? Or is the problem that the nib is drying out? If the former, try storing the pen cap down. That’s probably very inconvenient (and should be unnecessary but it might tell you something about the problem. 3) Lastly, if you pick up the pen every day, make a couple lines with it, and put it back down, will it still be writing at the end of a week? Again, very inconvenient but it might say something about the problem. 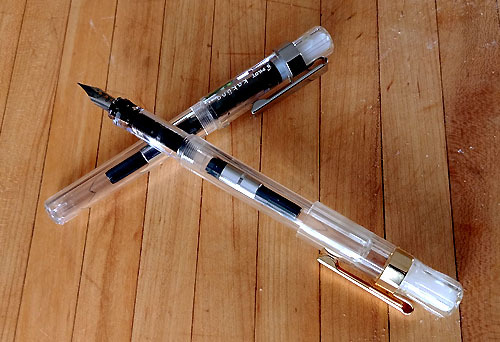 I sure can’t say whether Pilot or Platinum pens will solve your problems but I’ve found them to seal very well, minimizing ink evaporation which can be a problem for some pens. If you want to try a different pen without much investment, try a Platinum Preppy and a box of Platinum Carbon Black cartridges. The total cost will be less than $10 and it will work for you. 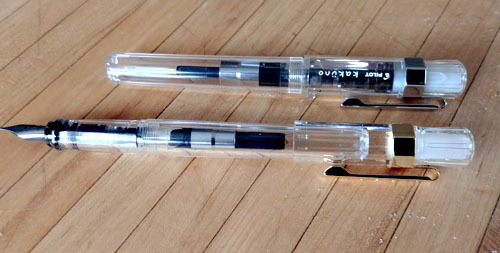 The only weaknesses for the Preppy is that they’re not the prettiest pen and, after a while, their snap-on caps fatigue and may break. I love my Kakuno, too! Does yours have a smiling nib? Hard not to love a happy pen! Thanks for he infrmation !